While the public's focus over the past year has been on Amazon's expansion into industries as diverse as groceries, pharmacies and delivery and logistics, one of the company's biggest success stories has largely flown under the media radar - until yesterday, that is, when the Wall Street Journal published a deeply reported story about the e-commerce behemoth's hostile conquest of the digital advertising business. According to WSJ, Amazon is the first firm to seriously challenge the Facebook-Google digital advertising duopoly that has for years controlled more than 60% of the market, largely thanks to the growth of Amazon's search-ad business. And thanks to its giant online marketplace, Amazon is benefiting from synergies that simply don't exist for Google. But the shift in spending follows a major change in shopper behavior: While Google has long been the dominant player in online searches of all sorts, some 54% of people looking for a product now begin their search directly on Amazon, a jump from 46% in 2015, according to Jumpshot, a research firm that collects data from 100 million devices. "Consumers are no longer double hopping between Google and Amazon, they just go straight to Amazon," said Scott Hagedorn, chief executive officer of Omnicom Media Group North America, the ad-buying division of Omnicom. The search-ad dollars shifting to Amazon are from companies that sell products on its platform, such as consumer packaged goods manufacturers and retailers, Mr. Hagedorn said. Though eMarketer doesn't have an estimate for Amazon's search-ad revenues from 2018, it expects it will account for at least half of Amazon’s $11.3 billion in overall ad revenue this year. The way Amazon's search-ad business is structured makes it particularly lucrative: companies bid in an auction-based system to have their product ads show up when a user searches for a term like "shampoo." Of course, Amazon only sells ads to companies that sell on its platform. But companies that use the service report a remarkable ROI on dwarfs Google's. Because of this, many have shifted more of their ad spend to Amazon. Men’s grooming product maker Oars + Alps LLC was using Google search ads last year but has shifted most of its search-ad spending to Amazon. Its monthly ad outlays with Amazon now top $20,000. "I was amazed at the return on ad spending on Amazon, so I lowered our spending in Google search," said Laura Cox, co-founder of Oars + Alps, which sells its products at Target, Amazon.com and on its own website. Ad executives said money for increased spending on Amazon search ads is also coming from other ad and marketing budgets, including in-store promotions and ads, and display ads. Dentsu Aegis Network, another major ad buyer, said its Amazon search-ad spending in the U.S. increased upward of 60% last year but only a small portion of the money likely came from budgets previously earmarked for Google. 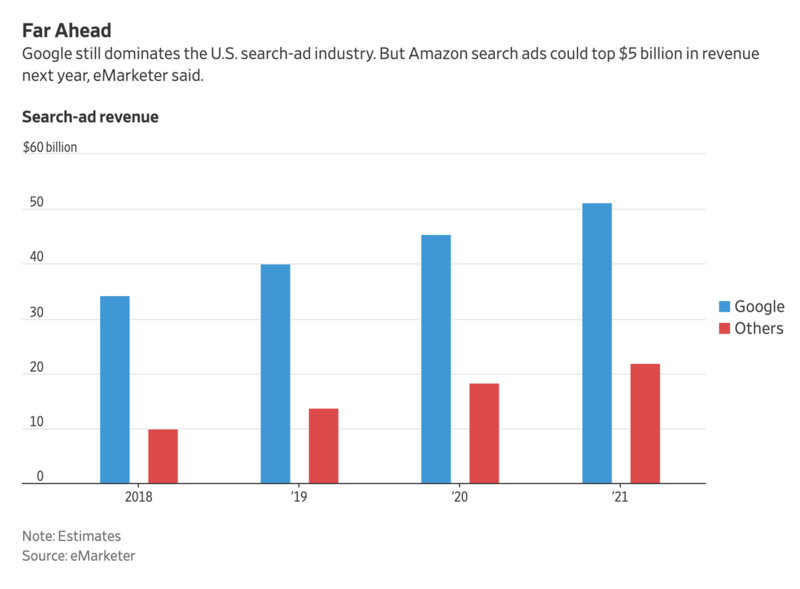 Moving beyond search ads, Amazon has build a brisk ad business that has moved the company into third place behind Google and Facebook. Amazon’s advertising ambitions have steadily grown. Beyond search, it offers other opportunities for marketers including display ads, TV-like ads in live sports telecasts and targeted ads it serves to people as they travel around the web. Overall, it is now the third-largest digital ad player behind Google and Facebook Inc.—the “duopoly” that combined controls about 60% of U.S. online spending. And Amazon is rapidly developing new advertising options, including video ads. If there's one risk to Amazon's aggressive expansion into the search ad market, it might be the company's own success. 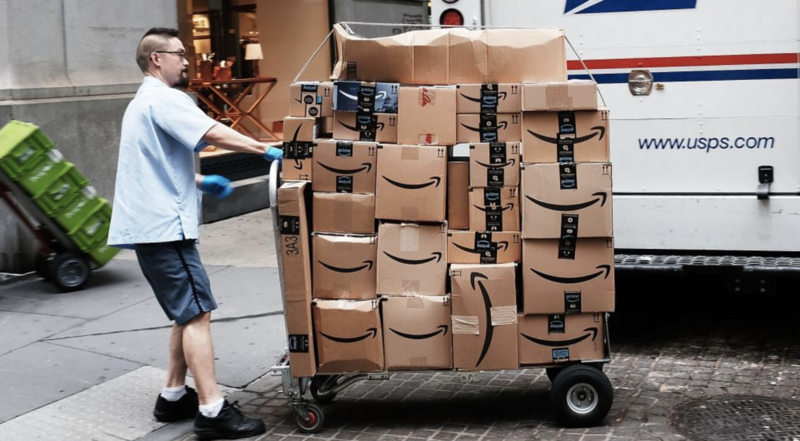 Because of its bidding system for placing search ads, brands' rush to buy with Amazon has sparked a bout of dramatic price inflation, that is swiftly forcing brands to reevaluate whether the ROI is still worth the price. Some brands are also wary of Amazon's ad business because they view the company as a competitor. The rush of ad dollars to Amazon does have a downside: a big jump in ad prices in competitive categories such as consumer products, ad buyers said. The cost per click on the search term “laundry detergent liquid,” for example, was $17.51 last month, a 127% increase from September, according to Pacvue, which provides tools for brands to optimize Amazon ads. "Amazon was extremely inexpensive" a few years ago but the influx of brands has caused a "significant increase in pricing," said Melissa Burdick, co-founder of Pacvue. Some brands remain leery of the company, viewing it as a competitor. Even as it helps other brands market their own products, Amazon is increasingly hawking its own private labels as well. But in the not-too-distant future, the expansion of Amazon's advertising business could transform the digital advertising duopoly into a triumvirate. Though that's probably the last thing digital media organizations and newspapers wanted to hear. But as the Trump administration ramps up its anti-trust scrutiny of big tech, this could be the rare issue where the Silicon Valley giants join forces with the Trump Administration against one of their own.